Young up and coming star Toby Waghorn took to the opening round of the Victorian Country Series on the weekend. After a strong showing at the Focus on Furniture Junior Top Guns claiming a round win, Waghorn was looking to have another strong showing. 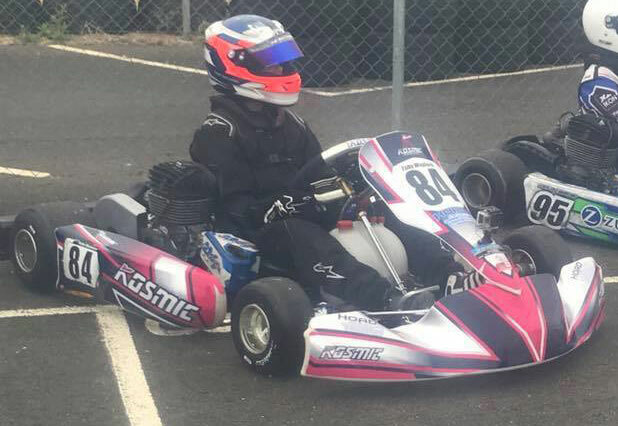 In a big field of twenty karters in the highly competitive KA4 Junior National Heavy field Waghorn was in the battle for pole position throughout the session! As the chequered flag fell Waghorn had put himself in third position on the inside of the second row only 0.220 of pole position setting himself up in a great position for Sunday and a great result. Sunday come round and heat 1 Waghorn was able to jump straight up in to second spot behind South Australian State Cup winner Joshua D’Ambrosio. Wahorn then dropped back to position three staying in the top four battle throughout the entire race. Waghorn maintained third place for most of the race before just losing out the battle for position four. Waghorn came home in position four keeping himself inside the top five for a strong result. Heat 2 came around and Waghorn was again out position three and after the opening lap stayed in position three stalking the race leaders. Waghorn stayed in third spot for the early stages before dropping a spot to position four. In a highly entertaining and close battle in heat 2 Waghorn was again able to come home in a respectable fourth only 1.640 seconds of the race winner while also gaining more valuable points and putting himself inside the top five for the final race of the day. The final and Waghorn unfortunately didn’t get the start he was after falling back to eighth and having plenty of work to do. The young charger on the opening lap immediately made a spot to move to position seven. After a hard fought race and battles all throughout the race Waghorn was able to come home in a creditable position five keeping himself inside the top five all weekend and grabbing valuable points to the championship standings. Young Toby Waghorn overall was very happy with the weekend along with father Jeremy. “All I wanted to do was make it into the top 10” said Toby Waghorn with results clearly showing he is a driver on the move and after only 18 months of racing racing father Jeremy Waghorn was also very happy. “I’m proud of his achievements in such a short time. We have only been racing 18 months so it’s been a great start to the season”. With only a short period of driving Waghorn is a driver to defiantly watch out for in 2019 with his next opening meeting being at the next round of Victorian Country Series at Portland.